We made it through camp without a thunderstorm today! :) There was an interesting moth on the black light sheet this morning. It had markings on its wings that looked like white sunglasses! It also had strange humps. I'm working on an ID on Bugguide.net, as soon as I get one, I'll post it. There are often many fascinating critters on the sheet each morning. We turn the light on before we leave each evening and are often surprised at what has come to it overnight. On the last day of the AMSE science camp each year we take the kids to the Oa k Ridge National Laboratory (ORNL) for tours of 3 different facilities. One of their f avorite activities is to see the robots at the Robotics lab. The engineers give talks and demonstrations on the different types of robots. Later each camper is given the opportunity to write with the mechanical "hot-cell hands" and a drive robotic chair. We also went to the Center for Nanophase Materials Sciences where we learned about how carbon nanotubes are made, saw clean rooms where the workers had to be covered from head to t oe in white disposable suits and a super-cooled tank where the temperatures can be dropped to nearly absolute zero! Our last stop was the Aquatics Building at the Environmental Sciences Division (a.k.a ESD, Oak Ridge has acronyms for nearly everything!). Here we got to see the artificial stream tanks and large tanks containg fish and turtles (right). After lunch at the ORNL cafeteria, we headed to the stream at the back side of the UT Arboretum to do our Stream Ecology class. The 3" of rain the past 2 days really had the stream gushing, so it was much harder to find the critters this time! But we still managed to rustle up a few craw dads, salamander larvae, stonefly nymphs, a huge cranefly larva, water striders, aquatic sowbugs and a few scuds (sideswimmers). It was a busy, but fun week. I think the kids learned a lot! Here's a shot of the whole group at the ORNL pond bridge after lunch. We've had an interesting week out at science camp. Yesterday we took a hike to the woods and later to a field. 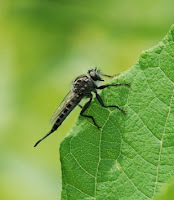 We saw some fascinating insects, including this Picture-winged Fly (left) and Robberfly (right). These large flies capture other insects and eat them. Earlier, we had a class on sound. After the lecture the kids got to try out some of the noise makers (supposedly to learn about soundw aves and vibrations), and they sure did make a lot of noise! We have seen some pretty cool critters too. This morning we caught a dragonfly that was acting very sluggish (otherwi se we probably wouldn't have caught it!). I put it in a large petri dish so I could photograph it up close. I was happy to get a pretty good photo of its eyes. Dragonflies have up to 50,000 fascets in their compound eyes. Click on the photo to enlarge it and see the small fascets. Both yesterday afternoon and today we had the added and unwelcome excitement of violent thunderstorms that blew through the area. Yesterday's storm hit just before the parents were to pick up the kids. We played a few games as we waited for the rain and lightning to let up. Today as I was teaching a geology class the weather radio alert alarm wailed letting us know another storm was on the way. Soon the western sky turned a nasty purple color and the wind began to blow. We quickly moved the materials and kids inside and continued teaching the class the best we could. The kids adapted well to testing their rock samples sitting on the floor and benches as the thunderstorm raged outside. Tomorrow we will go to the Oak Ridge National Laboratory for a tour and then do the Stream Ecology class, I sure hope it doesn't rain again! It's the second week of June, so it is time for the American Museum of Science and Energy's Science Camp. This is our 20th year for these camps. I've done every day of them except 3 (a few years ago)! Science Camp is full of adventures each year, we never know what will happen! The camp is held at the historic Freels Cabin on the Oak Ridge Reservation. The cabin was built in 1803 and is still in remarkably good shape. It is located on Melton Hill Lake in Oak Ridge. There are several hundred acres of undeveloped land, a pond and the lake surrounding the cabin. What a wonderful place for 21 rising 5th - 7th graders to explore! Each day we start out by doing an activity called Habitat Hunters. The campers go to a different habitat each day and look for animals or signs of them. I take a group to the field where we look for signs of deer, rabbits, lots of different insects, etc. Another counselor takes a group to the pond and lake. We set a turtle trap in the pond the night before (with smoked Vienna sausages!) and see what gets caught overnight. Yesterday and today we caught several turtles, including this little Eastern Mud Turtle (left). When I looked it up in my reptile ID book, it didn't look quite the same, the one in the book had been cleaned up and wasn't covered in algae! Today we had a museum employee who is a part-time taxidermist come out and talk to the campers. These two boys couldn't resist trying on the bison's horns that he brought! Yesterday one of the girls found this Octagonal Casebearer Moth larva (right) dangling from a silk thread near the cabin porch. The kids were a bit taken aback when I told them the caterpillar makes its home out of tiny bits of its poop (called "frass") and silk! Click on the photo and you'll be able to see the fine craftcaterpillarship (I really can't say craftsMANship!) put into the case. :) The caterpillar is stretching out of the case trying to flip itself back over. I'll share more camp experiences later on in the week!